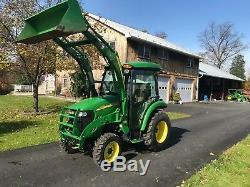 2010 Model Year John Deere 3320 Tractor, 33 Engine HP, 3 Cylinder Yanmar Diesel Engine, 858 Hours, 4x4, 3 Range eHydrostatic Transmission, R-4 Tires, Power Steering, Mid PTO, Rear PTO, 1 Rear Hydraulic SCV, Load Match, Factory Cab, Suspension Seat, Heat, A/C, Defroster, Front and Rear Wiper, Front and Rear Worklight. 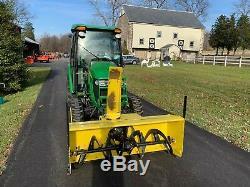 John Deere Front 3 Point Quick Hitch. 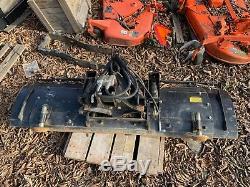 John Deere 59 Front Mount Snowblower, 59 Wide, With Adjustable Skid Shoes, Reversible Scraper, Hydraulic Up and Down, Hydraulic Chute Rotation, 2 Stage, 2 Drift Cutters. 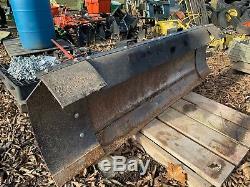 John Deere 366 Front Mount Blade, 66" Wide, with JD Extensions to 84" Wide, Hydraulic Lift and Angle, Heavy Duty Skid Shoes, Spring Trip Protection, Top Rubber Deflector. 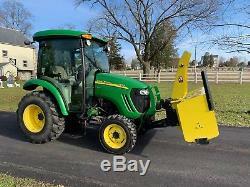 John Deere 300cx Quick Attach Loader, 60 Quick Attach Bucket. 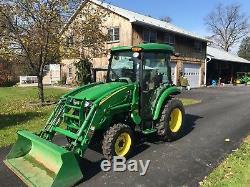 This John Deere 3320 tractor is in nice condition and has 858 hours, well cared for and everything runs and operates perfectly! All the attachments are in nice shape and are easily swapped out without any tools required within a few minutes. 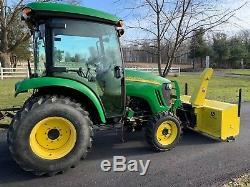 The John Deere factory cab makes this a four season machine. The cab is tight and pressurized, with heat and air conditioning. Tackle your property chores in comfort with minimal effort! The snowblower is the ultimate snow machine, and is easily controlled from within the comfortable heated cab. Easily tackle whatever the weather throws at you. 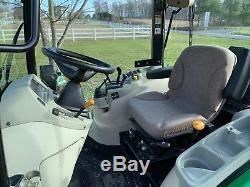 The loader is an easy quick park design and allows you to switch between the loader and blower in a matter of 10 minutes without tools. This is a pre emission machine and the 20 series Deeres were the last models made without the headaches of tier 4 engine emissions equipment. 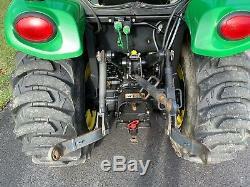 This tractor is easily maintained and will run thousands of hours without issues. 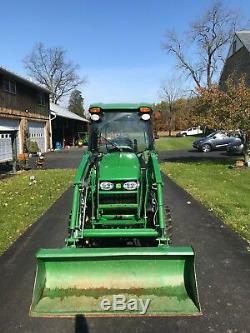 We are BWS Quality Used Equipment, located in Quakertown, PA. 18951 and your welcome to come inspect the John Deere, just call so I can be here to show it to you. We are in the equipment business for over 40 years and deal in low hour quality units, just look at our feedback. 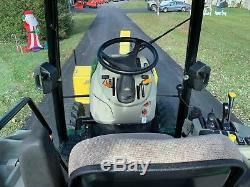 People have bought tractors from us sight unseen other then pics and talking to us and when they get there unit we ussally get a call telling us that the unit is much nicer then we told them and they are very very happy with there tractor. 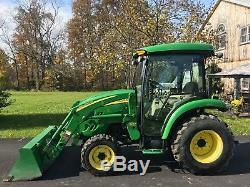 The item "John Deere 3320 Tractor, Factory Cab, 4x4, Hydro, Snowblower Loader Snowplow" is in sale since Thursday, January 17, 2019.